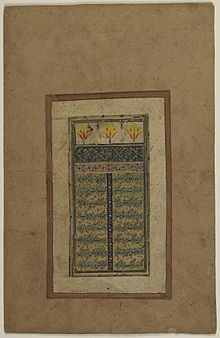 ​Bustan (or Bostan Persian: بوستان‎, pronounced "Bustān" ) is a book of poetry by the Persian poet Saadi, completed in 1257 and dedicated to the Salghurid Atabeg Sa'd I or Sa'd II. It was Saadi's first work, and its title means "the fruit orchard". The book contains the fruits of Saadi's long experience and his judgements upon life, and is illustrated by a vast collection of anecdotes. It includes accounts of Saadi's travels and his analysis of human psychology. He often mentions his accounts with fervor and advice similar to Aesop's fables. It is composed in mathnawī style (rhyming couplets), and has been translated into English and many other languages. The Bostan was translated into Dutch in 1688 by Daniel Havart.